Jubjub is a short mulit-use connector trail that joins Bandersnatch-East with Lower Red Queen Trail at the BTI intersection. Hikers, runners and equestrians may use it to connect from FS Road 2060 or Bandersnatch East to Red Queen and Bandersnatch. Bikers can use it to get to BTI. Bikers can also use it to gain access to Snark via the overlapping multi-use sections of Red Queen and Bandersnatch. 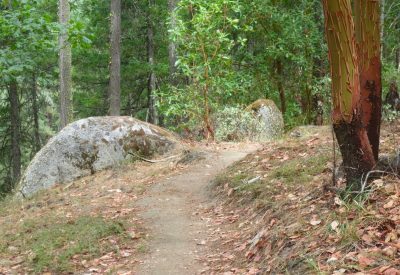 The Gimble Trail starts at the northernmost point along the Lewis Loops Gyre trail. Think of it as a lollipop loop, extending from the Gyre loop. The trail begins by descending along a ridge to the northwest and then turns west, still descending, to where the actual loop begins. Note the bear scratches on madrones. Enjoy filtered views of Mt. Ashland, Wagner Butte, and the Rogue Valley. 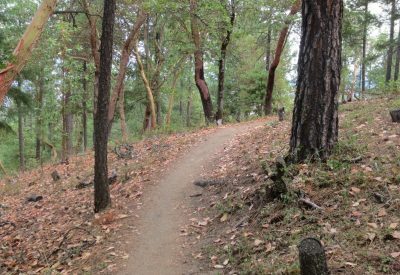 This trail was substantially re-routed and rebuilt in 2016 and connects from Ashland Loop Rd near the Cottle-Phillips trails to Bandersnatch, Jubjub and Red Queen. 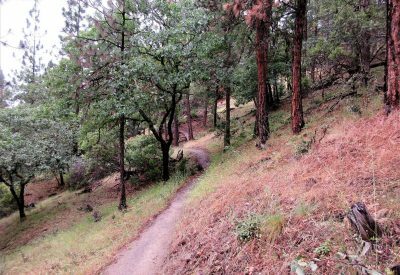 It climbs steeply at times on a ridge and affords views of parts of the Rogue Valley. Many shorter and longer loops are possible in conjunction with the aforementioned trails as well as FS Road 2060. This trail is pedestrian-only.